How to request 10Gbps BT Leased Line Costs with 15% discount across first year simply from buying via an Authorised Partner for BT. The capability to deliver BT 10Gbps leased line services is dependent on many factors. Within our BT partner relationship, the queries from businesses considering making the jump from 1Gbps services to 10Gbps are increasing. Are these high bandwidth services readily available? What are the considerations and costs? The cause for growing bandwidth requirements? The obvious answer is the tremendous growth in service consumption. The more complicated answer for business surrounds the way in which we’re working, our reliance on cloud-based applications residing on the Internet. Core Enterprise applications such as Unified Communications are becoming more sophisticated, driving features resulting in further bandwidth needs. Services such as video are popular today, but traffic is due to grow in demand further as we approach 2020 and beyond. If you need further evidence of the need to consider 10Gbps leased lines, also consider the usage of 3G / 4G and shortly 5G connectivity. What is the typical cost of a 10Gbps leased line service? The answer depends on your distance to the local BT POP (Point of Presence). About us. You are still buying a direct BTNet service, not a 3rd party. Premier and Authorised Partners of BT do not own any end to end customer contracts. In other words, we technically manage your account, but your order is placed directly with BT - BT provides product support and billing, just as they would if you ordered directly. What is our Ethernet offer? Network Union are offering 15% discount on the first year's annual rental cost for both 3 and 5 year contracts across BT leased line costs. There are no added fees or margins. All leased line pricing is directly provided by our BT resources; there are no added fees or margins. In fact, the portal will search and apply the very latest BT offers and associated cost. How to obtain the discounted Ethernet offer? To apply, simply submit your postcode and phone number, we request the latest best deals and leased line costs from our BT team, apply the discount and return the pricing / connection quote back to you. Simple. If you decide to go-ahead, we'll explain how our team will account manage your BT Business services; we'll collate the required connection detail and submit the orders via our BT team. How the pricing discount is applied? As we do not own your contract, our current leased line discount offer is directly applied to your BT invoicing. A clean way to obtain your offer without some convoluted cash back scheme. On this page, we'll show you how we achieve 10Gbps BT leased line pricing discounts of 15% across your first year sales order value. Read on to learn more. We want to build trust in our approach, if you would like to speak with our BT employed Sales Specialist to achieve your discounted offers directly from BT, please let us know and we'll send you contact details. The typical route into buying leased lines is via the BT sales number where you’ll be put through to your BT Local Business contact. The second option is to buy from an Authorised BT Partner (Network Union is a Premier Partner). If you view the BT.com Partner website page, you’ll see Network Union listed as an Authorised Partner. We work across the UK and NI. IMPORTANT - Whether you choose to buy from Local Business or an Authorised Partner you are buying a direct BT leased line services in respect of contracts, support and billing. To learn what your business could achieve by buying from the Chanel, get in contact. The first point to make applies to all bandwidth levels including both 1Gbps and 100Mbps. If your business location resides in an idyllic countryside setting, away from the local BT POP or generally in an inaccessible area, the cost and pitfalls are magnified. Distance to the local BT PoP? The further your site is from the local POP, the higher your costs due to the extended tail circuit reach required. The only way to establish POP distance is to request a quote which will output the local POP address and the potential radial miles from your location. However, even without a quotation, businesses are typically aware of their locations vs. infrastructure whether city or town. If you’re looking at sheep, expect a steep quotation. The capacity for 10Gbps services is often constrained depending on the POP location and the fibre which may, or may not, exist at your office site. In metro London, BT (Open Reach) may well lay 10Gbps capacity for new infrastructure or growth areas as demand is deemed to be higher vs. other comparable locations. But even where the capacity to the street exists, work is required to pull the fibre through to your building together with installing high capacity termination equipment. If no infrastructure exists, 10Gbps capacity will need to be created which has the potential to create excess construction charges. The current excess costs covered by Open Reach are up to £2800, so there is the possibility. And, as we know from 100Mbps and 1Gps projects, issues such as wayleave or council traffic management all conspire to delay your circuit further. In short, there is every chance of a successful project, but we would always advise a cautious approach to delivery timescales and costs. There is the possibility that you'll experience excess install costs, delivery and protracted time scales and even delivery failure. Why the demand is growing for 10Gbps leased line services? Implementing the right architecture to deploy high bandwidth services is a necessary consideration due to the cost and security implications of large capacity circuits. We would presume the need for 10Gbps Internet is, for the most part, required to support vast quantities of users or perhaps inbound traffic delivered to a large customer base. Whatever the reason, as bandwidth increases, the need to improve security is necessary. DDOS (Denial of Service attacks) are on the increase as are other methods of intrusion to destroy or take data without authorisation. When your organisation traffic moves toward the need for 10Gbps, serious consideration must be given to security architecture. In some businesses, relying on service provider cloud access is an acceptable method of integrating high bandwidth 10Gbps leased line services. On the flip side, other Enterprise companies would not trust the process and security offered by cloud access. 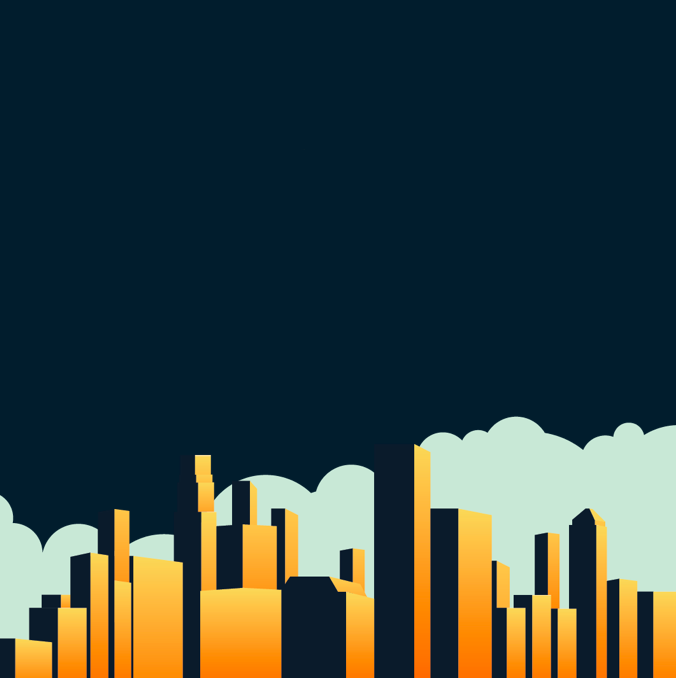 Over the last ten years, we have witnessed a shift to centrally located applications within data centre locations. In a twist we would not have predicted back in the day, local Internet access is becoming popular again as cloud hosted software as a service is such a conventional technology. Coupled with the growth of WAN technologies such as SD-WAN (SDN), the Enterprise is looking to future proof their needs where possible. Above. Distance to the BT POP vs. pricing. Installation of 10GB Leased Lines within Data Centre infrastructure. An ideal location for any leased line circuit delivery is within an on-net data centre, i.e., where no tail circuit is required to deliver 10Gbps leased line connectivity. In this scenario, the data centre or hosting facility will request back to back connectivity via an interface and internal cabling routed to the BT provider edge hardware inside the physical location. Data centre connectivity for 10Gbps services. Providers such as BT will typically reside within most data centre locations; we’re able to check availability where required. If your requirement is in addition to existing or new WAN connectivity, there is some mileage in considering provider breakout routed via MPLS, VPLS or SD-WAN services. In this respect, the data centre becomes another node on the WAN removing the need to implement large 10Gbps site connections locally. As no tail circuit is required, delivery is usually swift and without the typical issues which invariably challenge all leased line circuits regardless of bandwidth capacity. One issue we do occasionally find is capacity due to poor infrastructure planning from the facility provider. 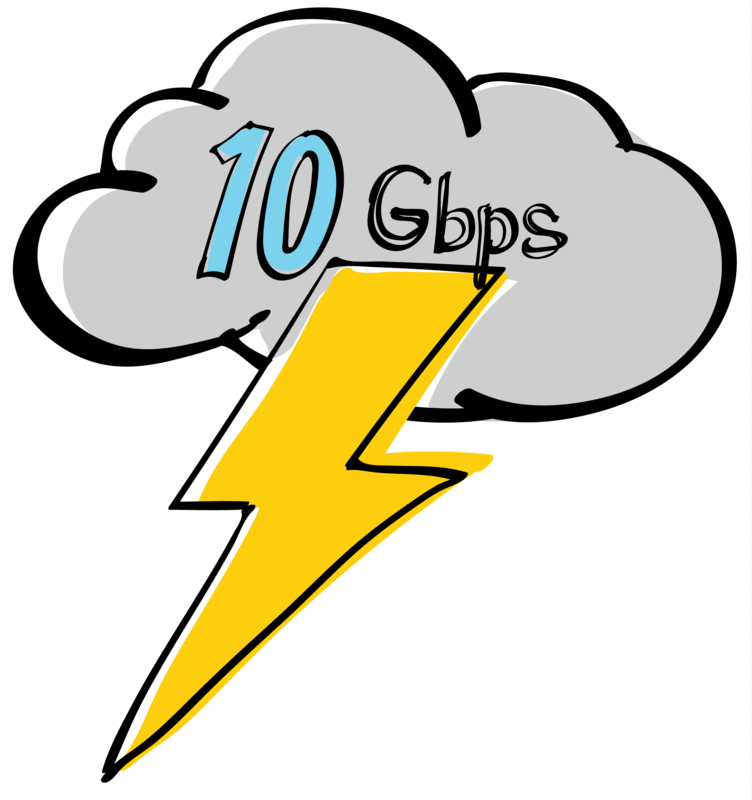 The 10Gbps cloud based option? A third option to deliver connectivity is via cloud access. We previously mentioned using the WAN as an access method within a hosting facility. Access for high bandwidth services via the cloud. With cloud access, the theory is pretty much similar in the sense of how traffic from your business office sites traverses WAN connections to the cloud-based breakout service. Service providers will typically offer shared security services with cloud Internet based on various tiers of capability. What are the standard costs for 10Gbps leased line connectivity? The tool we use - idesk - only produces 100Mbps and 1Gbps circuit pricing. Where greater than 1Gbps is a requirement, we submit the request directly into BT. The provision of dual 10Gbps circuits would result in potentially significant costs depending on excess construction and the required route through the BT network. No single point of failure where possible. BT RA02 services are designed, subject to survey, to deliver circuits through the tail circuit network with no single point of failure. If budget is there, the dual, resilient and diverse architecture is the ideal capability. Where budget is more constrained, there is the potential to add a lesser bandwidth secondary failover circuit, e.g. 1Gbps. However, readers should note there is an obvious mathematical difference between asymmetrical bandwidth services, i.e. 10Gbps doesn't fit into 1Gbps. In the event bandwidth becomes high, there is potential congestion risk if traffic routes via the failover circuit. The Internet, Public IP Security and SLA. Security is important regardless of circuit size, but as your WAN or Internet connections grow in size, security implications become severe on the scale of IT project priority. The SLA provides an indication regarding the overall performance of your leased line circuits. The design of your leased line should also encompass security, such functionality of zoning is typically a good idea vs. a flat network. Total Care support with 24/7/365 cover including a 4 hour response time and 5-hour target fix. Average round trip delay latency of 20ms or less and 95ms to the USA. Services are delivered to an agreed contractual date - if BT fails, a service credit is applied. 75% of people connected to the Internet are one hop away from the BT Internet network. Above. The internal tool we use to request pricing. Outside of BT Leased Line, what other capabilities are offered? BTNet Reporting is available for free including usage and uptime reports. Questions about how BT leased line costs and service? Leave a comment or get in touch via our contact page. Also applies to 10Gbps BT Leased Line orders. How our discount offer works? The BTNet Ethernet Leased Line discount offer. 15% discount on the first year's annual rental cost for both 3 and 5 year contracts across BT leased line costs. What you need to know? 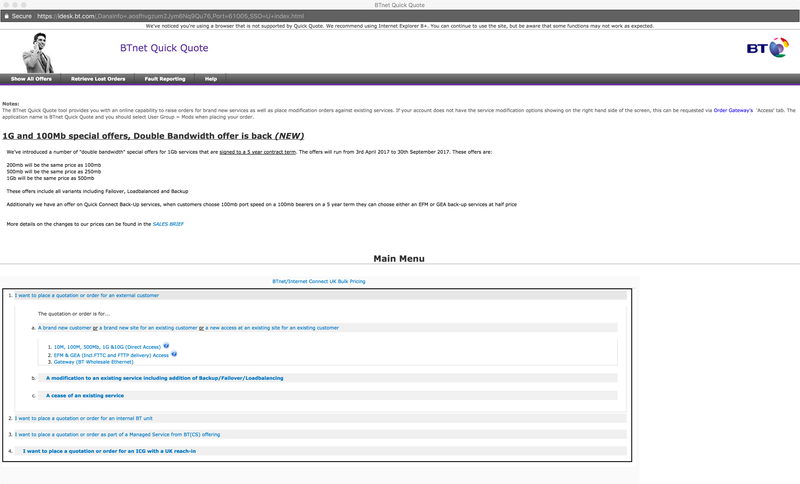 All BT Leased Line Ethernet orders are placed directly with the BT channel. All contracts, support and billing is provided by BT. Network Union operate as technical account managers, your interface and alternative route into BT Business.